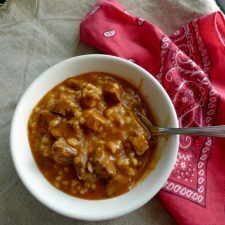 Old-Fashioned Hearty Beef Barley Soup is one of those soups that can go from mediocre to outstanding by just applying a few different techniques plus common ingredients such as you’ll find in this old family standard. The time you spend in preparation is minimal. Long slow cooking is what brings out the flavor of this hearty beef soup. With cold weather just around the corner, this beef soup will warm the heart and tummy. The ingredients and stove do the work all you need to do is collect the praise. For this recipe, you will need: beef, butter, olive oil, celery, onions, garlic, Italian parsley, fresh thyme, bay leaves, V-8 Juice, red wine, beef broth, barley, salt, and pepper. How to make a good beef soup. Now this recipe is not just a runnier version of a beef stew as we’ve seen in some versions. Nor is this soup just an excuse to use leftover meat as is typical in some beef barley soup recipes. Oh no, our chuck blade is freshly ground and diced by my Honey. After the beef is sautéed with the onions, celery, garlic, the meat, vegetables, and herbs are slowly simmered to make a rich, tasty broth. Then enhancing the richness of the broth is the addition of red wine and spicy V-8 Juice. Finally, let all the ingredients simmer slowly so that every bit of flavor combines to make a delicious hearty soup. It all boils down to using fresh ingredients to build a delicious base. Then adding flavored liquids to the base so that the meat cooks in a rich broth. My mamma loved our soups and this one along with our Pasta e Fagioli was one of her favorites. Although she loved to cook it didn’t make sense for her to make a big pot of soup just for herself. Have you ever tried to make a small pot of soup? It is nearly impossible. You start adding a little of this and a little of that and before you know it, you’ve got a gargantuan pot! So, we ended up making the beef barley soup and sharing it with my mamma and even my in-laws. An expensive gift wouldn’t have meant as much to them. Our barley soup is very thick, almost stew-like. 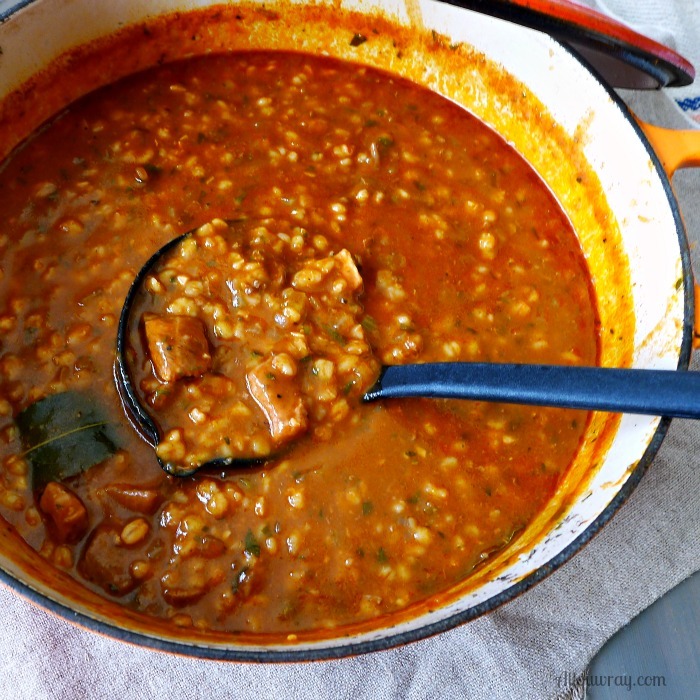 I remember one time in particular when we made our Beef Barley Soup and gave some to my mamma. We gave her enough for several meals. Each evening I’d call mamma at 5 pm and I’d ask about her day. We’d chit chat for a while and I’d always ask what she was having for dinner. She would answer Beef Barley Soup. Several days later I stopped by to take her to the grocery store. When we got back to her house I asked what she was going to have for lunch. Well, she got this sheepish look on her face. She opened the refrigerator and took out her little cooking pan — the one she always used to reheat her soups. In it was what looked like Beef Barley Soup — but not quite like what we had given her. I gave her a puzzled look. She took out a glass jar containing a light tan colored liquid from the refrigerator. She unscrewed the liquid and let me take a sniff. Beef broth. It suddenly dawned on me what she’d done. This was her way of making it last. I gave her a big hug and told her we’d make her some more — she didn’t have to add broth to it. When I told Honey about the soup episode it took him a few minutes to get over the shock of someone “watering” down his perfectly good soup. Once reason took over, he decided to start on a new batch of soup so mamma wouldn’t feel the need to ration (ruin) the soup. But that was my mamma and my papà too. They didn’t waste — they economized. They weren’t hoarders — not by any means. Everything in our home was as neat as a pin. They just never took anything for granted and they used whatever they had until it had no more use left in it. 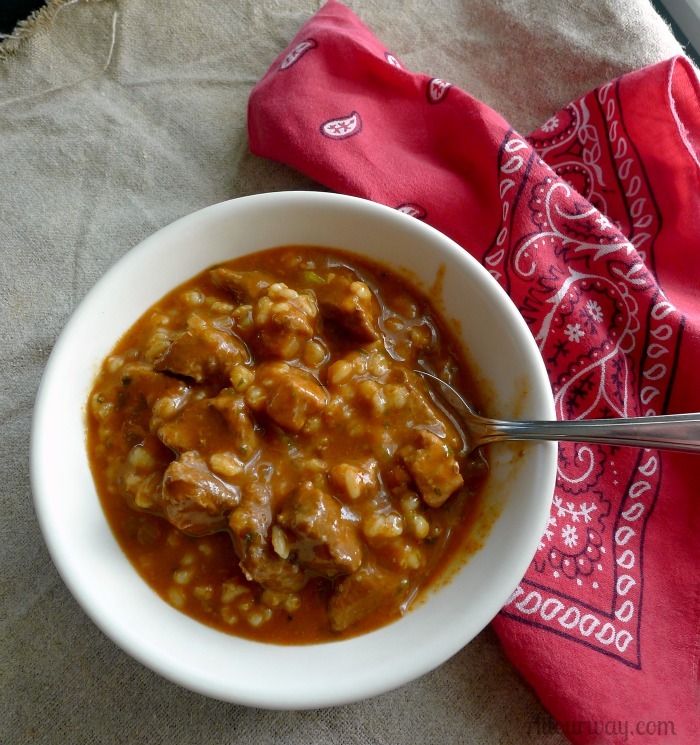 Old-Fashioned Hearty Beef Barley Soup is your basic comfort food. This is the type of soup that’s perfect on a cold winter day. It makes you feel all cozy warm from the inside out. And even though it is a hearty soup it isn’t high in calories. Your family will love it and if you don’t like it too spicy, serve it with regular V-8 instead of the spicy. Can I substitute the beef with another meat? Absolutely! The other day we wanted to make another batch of beef barley soup. We’d invited our son over for lunch the next day. So, we had to stay true to our promise. Well, as we stood at the meat display case and saw the price of chuck roast we couldn’t bring ourselves to pay the high price. The meat in the soup is so tender it melts in your mouth. Amazing!! The flavor is wonderful – we certainly didn’t miss the beef. 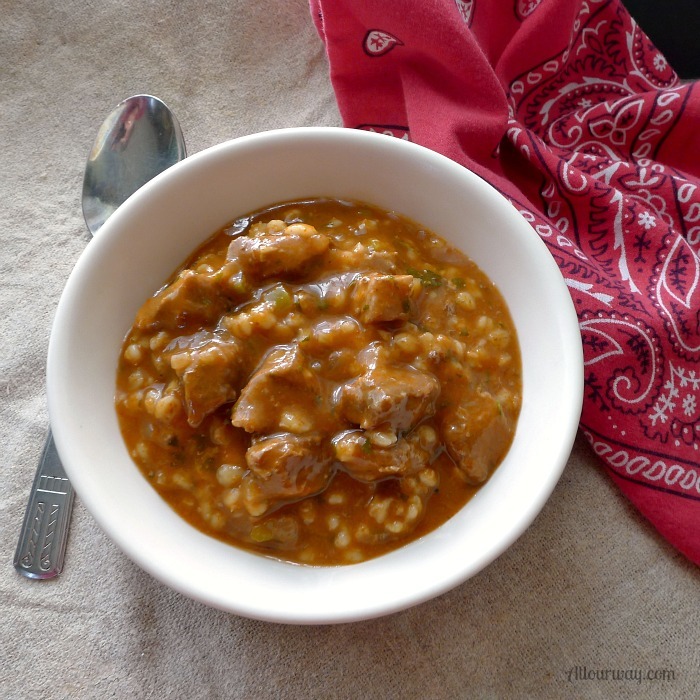 So, if you find yourself craving a hearty beef barley soup and you don’t have the beef for it, see if you can find some good pork. These soups or stews will warm you up from the inside out! Thanks so much for being a part of All Our Way! This hearty soup is perfect. Thick almost like a beef barley stew, and spicy just like you’d want. This is the type of comfort soup that makes you anxious to get home so you can savor a warm, satisfying bowl. Serve a small bowl or cup as a first course or a larger portion as the main dish for dinner. It keeps well in the refrigerator and tastes even better the following day. If you like this recipe, please consider giving it a five-star rating. 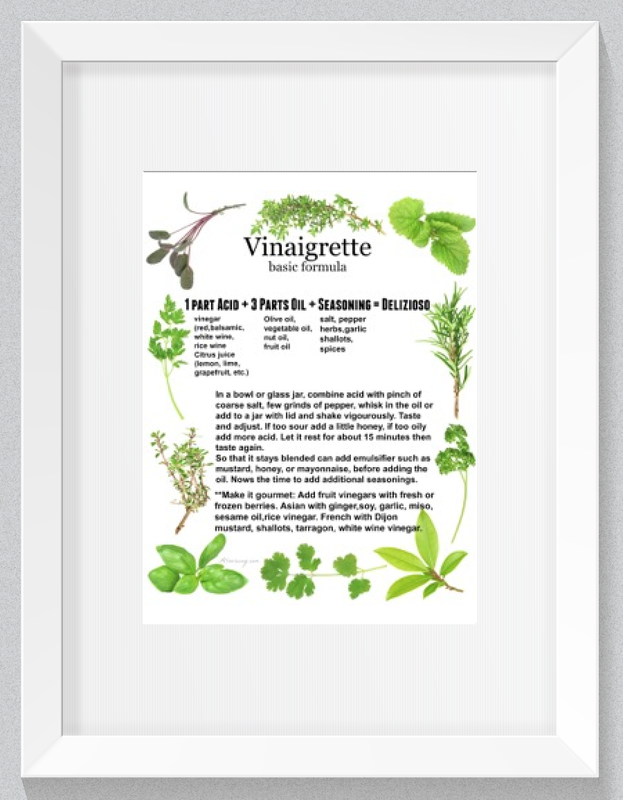 This helps others to consider whether to try out the recipe. A satisfying soup that warms you from the inside out. The beef is slowly simmered and what remains is delicious broth that is made richer with the addition of red wine and spicy V-8 Juice. In a Dutch oven or heavy soup pot, over medium-high heat, brown the beef in 1 Tablespoon butter and 1 Tablespoon olive oil. Salt and pepper the meat as it is browning. Once the beef is browned remove it and all the juices and place in a heat proof dish. In the Dutch oven melt the remaining butter in the olive oil and sauté the celery and onion until they become soft and translucent. Do not brown. Stir in the garlic; sauté 1 minute. Add the parsley, thyme sprigs and bay leaves . Continue to sauté for another minutes. Add the beef back into the pot and mix thoroughly. Once all of the ingredients are evenly mixed add the Spicy V-8 Juice, beef broth and red wine. Heat to a low boil, add the barley and let it come to a simmer then cover. Continue to cook covered stirring occasionally. Simmer for 4 - 5 hours until meat is tender and barley is done. Taste again to make sure the salt and pepper is to your taste. If you don't like spicy you can substitute regular V-8 for the spicy. You may use boneless country style pork ribs for the meat in the same quantity as the beef. Note: Recipes and content from © 2014-2018 All Our Way are copyright protected. Please do not use content or recipe without prior written permission. If you want to share the information please link to the post. Grazie! Perfect timing to stumble upon this wholesome recipe. Another snow storm expected this week and I love to have a pot of goodness on the stove for that. I have never made beef and barely soup, but it was one of my husband’s favorites growing up and I think it’s time I give it a try. Oh I haven’t had a good beef barley soup in forever. This one certainly sticks to the ribs and offers a big ol’ belly full of comfort. Totally agree that slow cooking the beef makes for the best flavor, and separates this from the other quick recipes out there. Ooooh just looking at these photos makes me feel a bit cozier. 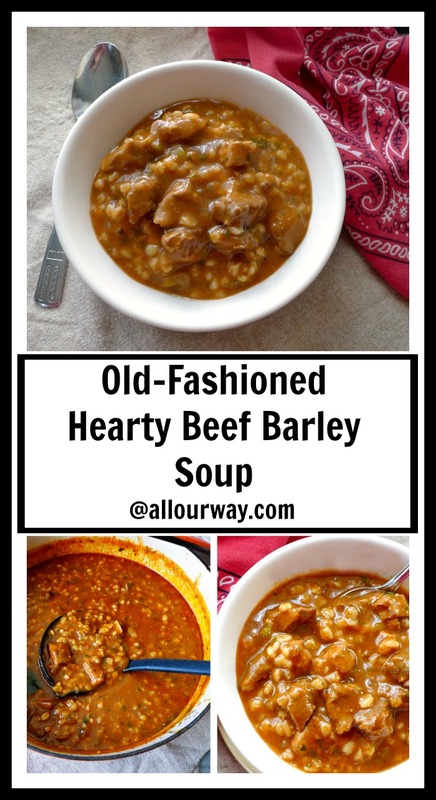 I love a good beef barley soup and it makes it that much more special that you can share with your mamma. Total genius to add that V-8 by the way. I would never think of that! This reminds me so much of my Dad’s homemade soup. Or as we liked to call it, “Stewp”. We could never decide if it was a soup or a stew because it was so thick and hearty. This totally has that going on and is perfect for this time of year! What a lovely story about your mother! Soup is the perfect gift for someone who doesn’t cook as much. It’s like giving love in a jar! This soup looks so delicious that anyone would be grateful to receive it! I’ve never thought of using v-8 in soup. Interesting idea! Way to sneak those veggies into the beef soup. Love the story of stretching out the soup. That’s so sweet that she enjoyed it so much! The cold winter has had me craving comfort foods. 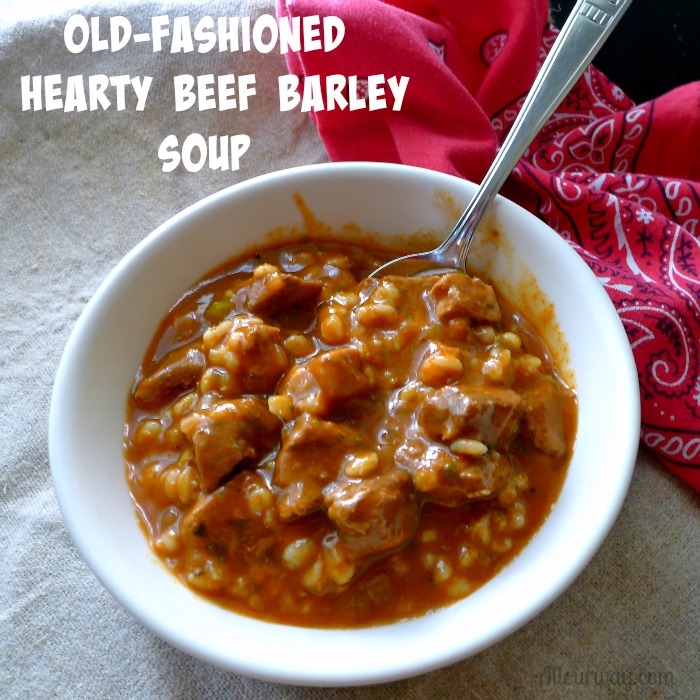 This old fashioned barley soup is just what I need! It looks so hearty and I have a feeling that it’s going to hit the spot. Being frugal and not wasting anything sounds like my older Italian relatives. There is nothing like coming from a small, poor town in Italy to teach you the value of making things last. 🙂 Though I completely understand your husband! When you’ve made a beef barley soup as good as fresh as this one, you don’t anyone messing with it! Thanks for the great hearty and cozy recipe. I agree, its impossible to make a small batch of soup. Your soup looks absolutely delicious and hearty. I have never used spice V8 juice in cooking before, I am really loving this kitchen hack. what else have you used this for? I think it’s brilliant. I love that your mother loved your soup so much that she was trying to make it last. That’s beautiful. Thanks for sharing your story. I love how thick the soup looks and I really like the addition of V-8! Looks delicious! I love making a big pot of soup on the weekends. 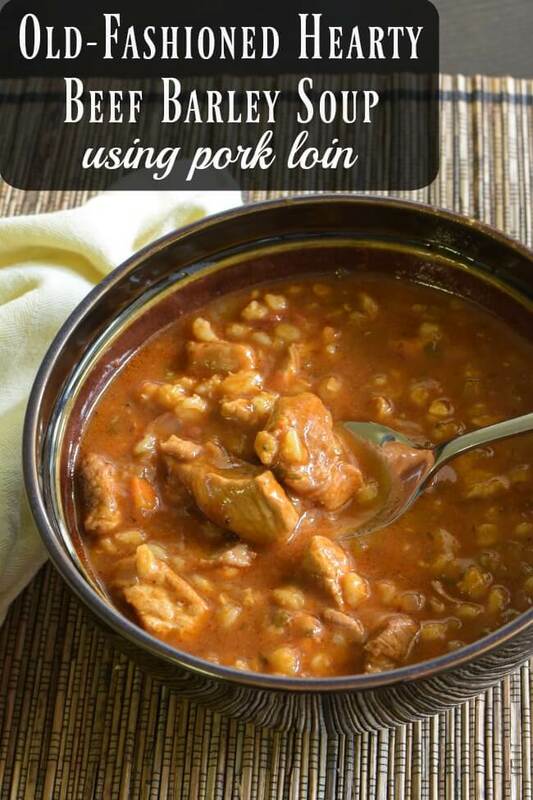 I’ve had beef barley soup and pork barley soup sounds amazing. 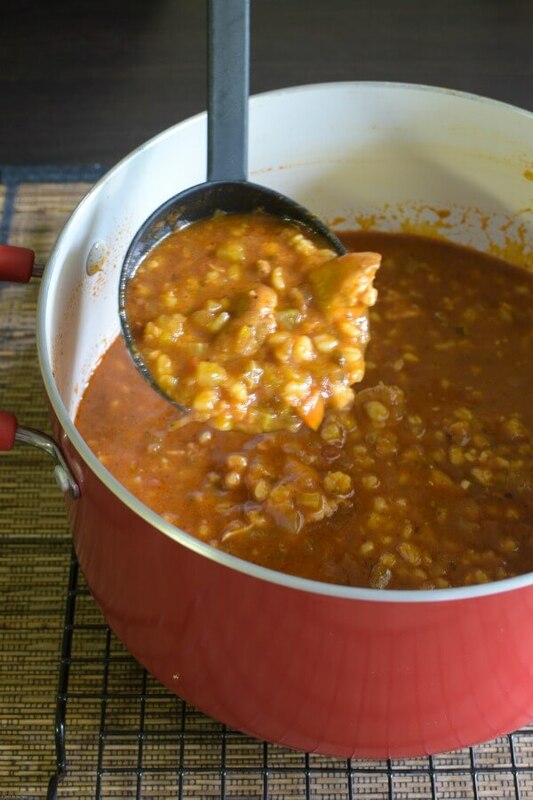 I love beef and barley soup….well I love most soups but this has become a family favorite. That’s cool that you have noted that you can use pork too. I have never tried it but I’m going to next time. Great recipe! I love how thick and comforting this looks. So rich and wholesome too. This year we have been doing more soups than before. I have never used barley in my cooking but this year I want to try. Awww your mamma reminds me of my grandma. She would do that too and never took anything for granted. And BTW I love how thick and rich this looks. Perfect for the weather we’re having! Your Mama and In-Laws are very lucky to have you to cook for them — and I love that she was stretching the soup to make it last. You might need to make a few more batches and freeze them so there’s always some at the ready for last minute lunches and dinners for your Mama. 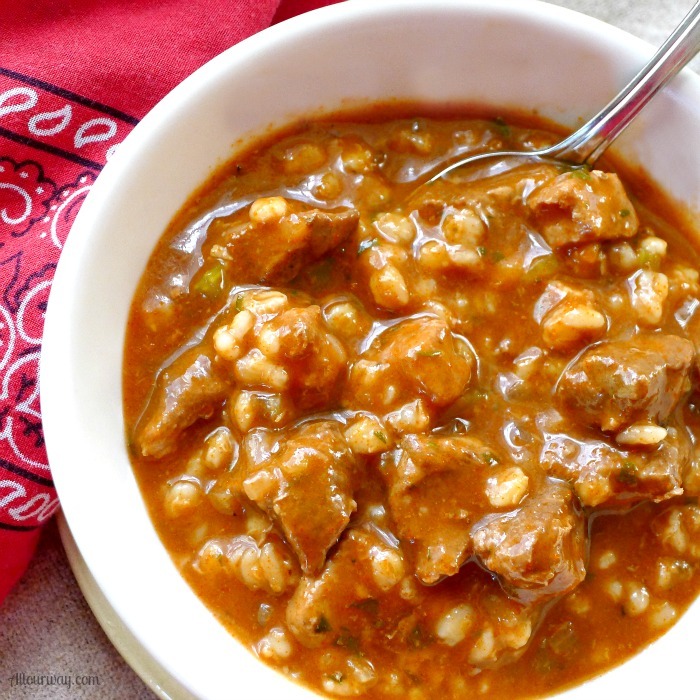 This beef barley soup is so rich and thick with those big chunks of chuck roast (or is it pork – LOL) I think all I’d need is a green salad and a pour of wine to be perfectly content! It has been SOOO cold here. This is exactly the kind of meal we need to warm up with. I HATE shoveling all the snow, and we are getting dumped on again. Having this ready to eat makes things so much better. One of hubby’s favourites for sure. Can you add dumplings to this please? Oooh! Now you’ve got me thinking! !